EuroSlots Casino :: MUSE: Wild Inspiration video slot - PLAY NOW! 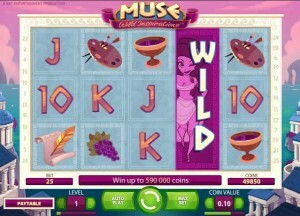 March 21, 2013 (Press release) – Net Entertainment, the world’s leading provider of high-quality online casino games, announces the launch of its latest video slot, Muse: Wild Inspiration™. It is a 5-reel, 3-row game with 25 fixed bet lines, which features one Wild Inspiration symbol that includes three different Wild features; an Expanding Wild, Sticky Wild and x2 Wild. Players are able to experience rich and colourful animations with Wilds to boost excitement on the reels that are substituted for the highest win combination possible on a select bet line. Muse: Wild Inspiration™ :: You can try this NEW Slot game right now at the following casinos: Unibet Casino, Maria Casino, Vera & John Casino, ComeOn Casino, Mr.Green Casino, EuroSlots Casino and RedBet Casino. ← Party Casino :: Melon Madness Winner Scoops Whopping $7.5m!